The Rivanna Water and Sewer Authority (RWSA) is an independent public agency that collects, treats, stores and distributes water and transports and treats waste water for residents of Albemarle County and Charlottesville. The RWSA is a wholesale agency with only two customers: the Charlottesville Water and Sewer Division and the Albemarle County Service Authority, agencies that serve individual retail customers. Funding for operations is paid for entirely by ratepayers, though local and state funding is part of the RWSA's Capital Improvement Program. The authority's headquarters are located at 695 Moores Creek Lane and the main phone number is (434) 977-2970. Bill Mawyer, Jr. is the current Executive Director of the RWSA. one member jointly appoined by City Council and the Board of Supervisors. Board meetings are generally held on the last Monday of each month, though construction at the RWSA headquarters has temporarily moved the meetings to the last Tuesday of each month. The RWSA is currently[when?] in the midst of a nearly $150 million Capital Improvement Program that includes implementation of the Community Water Supply Plan, an upgrade to the Moores Creek Wastewater Treatment Plant, as well as replacements of various sewer lines such as the Meadowcreek Interceptor. 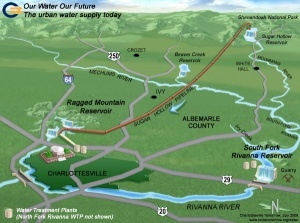 The RWSA has four reservoirs, connected by area rivers and a pipeline, as well as several water treatment plants. Wastewater is processed at the Moores Creek Wastewater Treatment Plant, which is located in the City of Charlottesville, discharging along the Rivanna River near Interstate 64. The RWSA has a permit from the DEQ to release treated sewage into Moores Creek. The agency owns 42.1 miles of transmission pipelines and seven pump station. Negotiations between the Charlottesville City Council and the Albemarle County Board of Supervisors led to the signing of the Four-Party Agreement dated June 12, 1973 by council, the board of supervisors, the Albemarle County Service Authority, and the RWSA. ↑ Web. Board Members: About Us, Rivanna Water and Sewer Authority, retrieved 18 July 2013. ↑ 6.0 6.1 Web. State Water Control Board Enforcement Action - Order by Consent Issued to Rivanna Water and Sewer Authority, Virginia Department of Environmental Quality, retrieved April 28, 2011. ↑ Bailey, J. Harvey. History of the Development of the Public Water System of Albemarle County, Virginia. April 1985. TS. ↑ Web. Four Party Agreement between Charlottesville, Albemarle County, Albemarle County Service Authority, retrieved January 6, 2012. This page was last edited on 21 January 2019, at 03:25.